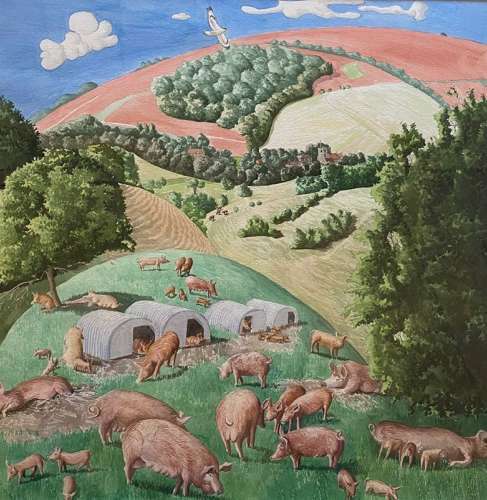 'Tamworth Pigs in a Wiltshire Vale'. 'Heaving, tumescent hills, feathery trees, soaring birds, topsy turvy puffing chimneys and undulating village streets are set with peaceful bicyclists, jolly riders, Lowry-small dog-walkers, pram pushers and ruminating animals. Deliberately selective, Farmar seems to look through a magic fish-eye lens which conjures up playfully billowing images of bucolic hedgerowed pastures and deliciously coloured buildings into little feasts of richly orchestrated tones........the evident way in which the weather and seasons affect the moods of these paintings echoes Farmar's interest in British inter-war artists of the 20's and 30's like Stanley Spencer, Paul Nash, Alfred Wallis and Christopher Wood, in his whose continuing tradition his work may be seen. He has evolved a singular vision, most notably of an England which is unashamedly poetic. Like Thumbelina on her swallow, we may be transported on the wings of his imagination to a never-never land. Taken from the introduction by Dr Nicola Gordon Bowe, Senior Lecturer in Art History, National College of Art and Design, Dublin, to the one man show of work by Francis Farmar held at Duncan Campbell Fine Art, 15, Thackeray Street, London, W8 5ET.